Terminal 2 at Surabaya’s Juanda Airport opens today. However, it is not confirmed which airlines will be moving into what was the international (east) section of Terminal 1, and which will remain in the domestic (west) section. It is hoped that the new Terminal 2 will ease congestion in the existing Terminal 1, which in 2013 handled 16 million passengers, double its intended capacity. The airport’s increased capacity may also improve airlines’ on-time performance. Where is it? How to get there? How to change terminals? Artist’s impressions and the above YouTube video suggest that Terminal 2 will be located next to Terminal 1, on the east side. If arriving by car/taxi/airport bus, Terminal 2 would be the first one after doing the usual 180-degree right turn around the car park. To walk from Terminal 1 to Terminal 2, (after exiting the T1 arrivals hall) passengers would need to turn right and walk 5-10 minutes, perhaps past the Ibis Budget Surabaya Airport Hotel. However, it is unlikely that Lion Air domestic passengers who are transiting Surabaya on the way to Singapore will get an airside transfer from Terminal 1 to 2; passengers would still need to pay international airport tax of Rp150 000 per person and pass immigration/customs. We will add updates below once the situation “on the ground” becomes clearer. Unforeseen circumstances – namely a volcanic eruption of Mt Kelud, near Malang – has resulted in volcanic ash blanketing Surabaya and the indefinite closure of the entire airport. Airports in Yogyakarta, Solo, Malang and Semarang are also affected. Juanda Airport recently tweeted a map of Terminal 2. In my opinion, it isn’t very clear, but others may disagree or find it better than nothing. Unfortunately, there is no map of the new domestic-only layout of Terminal 1, just an old one floating around. Ada yang bilang Citilink di terminal 2? Apakah benar? I heard Citilink is in Terminal 2? Is that true? No, Citilink is still in Terminal 1. The only domestic airlines in Terminal 2 are: Garuda Indonesia, AirAsia and Mandala Air. Surabaya Airport now has an inter-terminal bus from Terminal 1 to Terminal 2. It departs from what was international departures (keberangkatan internasional ) at Terminal 1. The arrival/departure point at Terminal 2 is not specified. I’m not sure taking the bus would be any faster than walking from Terminal 1 to Terminal 2, especially if waiting a while. The shuttle bus from Terminal 2 to Terminal 1 vv. in JUANDA AIRPORT, doesn’t in detailed to be informed. How frequent the bus going, from what time to the last hour the bus be operated etc ? I don’t know how often the bus departs. The Surabaya Airport website and Twitter account also does not answer this question. I suspect the first/last bus departs according to need. For example, the first international flights depart about 6am; the last in the evening. Please note also that Terminals 1 & 2 aren’t very far apart. If required, it is not far to walk. Although the new T2 is nice with many food merchants and ease the over capacity of T1, it’s actually quite disappointing in some aspects which is critical being an international terminal. 1) Bad road access compare to T1 where you can reach at the end of highway. You need to pass crowded and small road to reach T2. 2) T2-T1 interconnection for transit passenger is no longer convenience as in the past. 3) No atm and money-changer (I might be wrong) for an international airport is quite surprising. 4) No seating area in public waiting area. 5) Poorly design baggage claim are. The fence at turning point causes baggage jam. I mentioned that T1 and T2 can reach by walking since it too far. Do you have any clear direction to get T2 from T1 by walking? Previously I drive my car it takes around 20 – 30 minutes from T1 to T2. When leaving Terminal 1 and facing the car park, turn right and keep walking from T1 to T2. Travelling by car from T1 to T2 you have to go the long way round, so it takes a long time. The answer is here: Rp200 000. I’m flying in on Garuda from Singapore with ETA of 9pm. Is it advisable to get Ibis Airport hotel? Will it be easy to travel (how far is it to walk?) from Terminal 2 to Ibis airport hotel? What other hotel would you recommend for ease of transfer? My next flight is from Terminal 2 on the next day. Ibis Budget Surabaya Airport Hotel is the only hotel in the airport grounds. It is in Terminal 1, which is walking distance or a short ride on the free inter-terminal bus from Terminal 2. If your flight the following day departs early, I recommend staying at IBSAH. You can send an enquiry here. Other hotels near Surabaya Airport do not have the same quality of IBSAH. If your flight departs after 10am and you like some extra comfort (not budget), you might want to choose another hotel in Surabaya. The Sheraton Hotel often wins the local award for best hotel in Surabaya, while Majapahit Hotel is famous as a traditional hotel with local flavour. I’ve tried to virtually “walk” the transfer from T1 to T2 (turn RIGHT facing car park). However with streetview no walk visible. Isn’t it better to turn LEFT and take the Jl. akses Terminal I & II? 1. No, not enough time. We recommend 3+ hours between flights. You are making the dangerous assumption that Flight #1 arrives on time, which it may not. Also, you got to get your luggage from the carousel in Surabaya before going to Terminal 2. 2. Google Maps coverage of Indonesia is patchy at best and there isn’t streetview of the walk between Terminal 1 and 2. Taking the access road is the long way round. Check the YouTube video in the post above. Thanks for no. 1 hint. I will therefore plan with JetStar to SIN in the afternoon. Re. the walk T1 to T2 I have my doubts. I mean: T2 is just opposite T1 on the other side of the runway. The direct air distance T1 to T2 is 2 kms. I.e. if you walked straight across the runway from T1 to T2, you’d need 15 to 20 minutes. I you need to walk around the Airport, the whole walk will easily take up to 1 hour (distance is three times the direct air distance). Have you walked T1 to T2 yourself? Where does the information come from, that this only takes 5-10 minutes? In my opinion, this is completely wrong. > Where does the information come from, that this only takes 5-10 minutes? In my opinion, this is completely wrong. Unfortunately, I haven’t been to Surabaya Airport since Terminal 2 opened, so I can’t verify the location relative to Terminal 1 from personal experience. The construction of T2 east of T1 was abandoned. According to Google Maps (which now includes interior view using Street View! ), T1 and T2 are 5 kms apart. It’s because T2 is on the south side of the runway, while T1 is on the north side. Thanks for the clarification Johan. You’re right, Google Maps now uses a newer satellite picture and Terminal 2 marked. It is next to where the original passenger terminal (pre-2006) was. See it here. hello.. i use lion air and arriving at Terminal 1 and then need to take Air asia flight at Terminal 2… how am i going to travel from terminal 1 to 2? i arrive at Terminal 1 around 10.30 pm. is it easy to look for taxi or any accommodations? or can i just go by walking? is it safe? because it is midnight at that time.. please answer this. im a bit lost right here. need to catch next tomorrow morning flight.. There is an inter-terminal bus. Please see earlier comments for details. Are there pay per use lounges in the international part of T2. I am flying economy class on Silk Air, but will be at the airport for a few hours before my flight. The free shuttle bus can be caught from terminal 1 outside of entry 1A. When you exit just look for the 1A sign. I’m sat in it now. 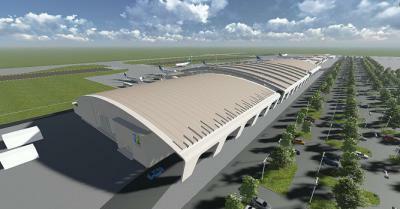 Comment on “New Terminal 2 at Surabaya Airport”.